We design and manufacture the CF2SCSI SCSIFlash and FLOPPYFlash CF based solid-state drives integrating our proprietary FPGA based technology. The industrial grade SCSI SSD solves the growing and increasingly expensive problem of repairing or replacing ageing and failing SCSI-based hard disk (HDD), SCSI magneto optical (MOD), SCSI tape, SCSI floppy (FDD) and true Floppy interface drives on legacy equipment. The SCSI SSD CF2SCSI drive combines proven SCSI drive architectures (SASI, SCSI-1, SCSI-2) with industry-standard, solid state CompactFlash card technology to provide a highly reliable, solid state drop-in replacement for any style of SCSI-based drive including hard disk, magneto optical, tape and floppy drives. Most importantly, the drive is completely programmable, enabling the SCSI driver implementation nuances of all equipment manufacturers to be fully emulated. Above image shows the solid state SCSIFlash drives replacing floppy/optical, tape & disk drives. 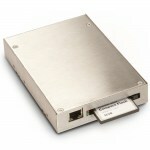 Available in 50-pin SCSI, 68-pin SCSI & 80-pin SCSI drive connector types. No additional software or register changes are required to the legacy host. Custom capacities available for systems that require exact capacity value & custom sector sizes available. Our customers include direct OEM vendor relationships, third party maintainance organisations and end customers globally. Our global sales are supported through partners in USA, Europe and Asia. Our latest SCSIFlash Network drive allows network back-up and restore capability enabling vital data back-ups to be made as a complete disk image of its CompactFlash card at any given point in time. Files can be transferred via the Ethernet network and stored remotely from the legacy equipment and restored as and if needed. Universal TCP is used for disk image transfers with remote execution of back-up and restore configuration operations controlled by user API or via a web browser and auto-online implemented on back-up completion. Our range of SCSI SSD drives or emulators provide a low-cost, solid state drive replacement that enables CompactFlash cards to be seen as SCSI drives by the host system allowing the system maintainers to manage critical obsolescence and Through Life Support (TLS) services. The CF2SCSI solution applies to a broad range of legacy equipment. The SCSI SSD CF2SCSI drives are also available to emulate SCSI hard disk drives (3.5 inch, 5.25 inch), magneto optical drives (Fujitsu, Sony, Ricoh, Jazz, ZIP, Bernoulli), tape drives (Pertec half-inch, QIC quarter-inch DAT, DLT 3490) and floppy drives (TEAC). Full programmability also enables other custom SCSI Bridge emulations to be easily developed. The industrial grade SCSI SSD CF2SCSI solid state disk emulator is currently supports CompactFlash drives up to 128GB and utilizes a 3.5 inch form factor (or larger 5.25 inch form factor). It is available in two package types either with no externally removable card as a hard disk replacement or with an externally removable CompactFlash card slot as magneto optical, Jazz, Zip, tape or floppy drive replacement. SCSI emulation disk sector size options available include 256 bytes, 512 bytes, 768 bytes, 1024 bytes, 2048 bytes & 4096 bytes per sector.